What is a good option for a highly portable neck traction device that can be used in a variety of settings with minimal down time for the patient? Portable neck traction collars are a simple to use and easy to transport option that can be instrumental in pain relief and management for those with chronic spine issues. This device, which is like a donut, slips over the head to the neck and then is inflated with a hand pump like a blood pressure cuff. However, instead of increasing the pressure inward, the air inflates the ring that pushes up on the chin and down on the shoulders, slowly and gently extending the cervical spine. It can be used when the person is sitting or standing, there is no requirement for the user to be in the supine position as with some other types of neck traction devices. How safe is the pneumatic cervical neck traction device to use for a patient? These devices are extremely safe to use. However, they are not recommended for recent injuries or for use without doctor's recommendation. These neck traction devices have a quick release option that allows the pressure on the traction to be released if any pain occurs when the pneumatic pressure is building. In addition, the hand pump feature prevents sudden increases in traction that may cause injury to pain if applied quickly. Patients need to report any pain, discomfort, or changes in movement or stiffness to their doctor when using any type of home traction device. Are there different sizes in neck traction devices and is it important to have the correct size? Can they be adjusted? The pneumatic cervical neck traction devices do come in different sizes, as do the portable neck traction models. The pneumatic models are available in standard, large and wide. Standard or regular and large fit approximately 95% of all patients. Most women will easily fit a standard or regular size, with men using the large size. The wide option has the ability to correctly align to correct the position of the spine and can be used with both men and women. These can be ideal for pain management and mild decompression and exert up to 25 pounds of continuous pressure to relieve pressure and stress on the spine. 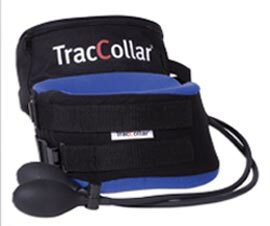 Collar style portable neck traction models come in a variety of styles to fit different neck dimensions. The sizes include small which fits a neck of 10-12 inches through to 2XL which is suitable for a neck that is 20 to 22 inches. To find the appropriate size simply measure at the widest part of the neck, the base, and choose a size that reflects that measurement. If your measurement is right on the outside range of one size, consider going to the next size for maximum comfort. Adjusting the sizing on these traction devices is not recommended. Selecting the correct size to begin with will provide the most safe application of traction, and will reduce the risk for the user.